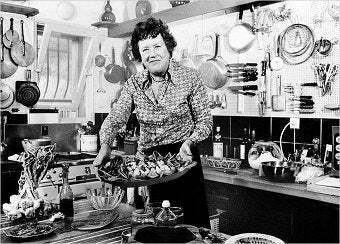 The French On Julia Child: Elle Est Okay. Call it the anti-Jerry Lewis phenomenon. Sniffs one Gallic critic of America's French Chef: "It's the vision of a revisited France, adapted to the American taste, at a time when tastes were lifeless." According to a nifty piece in the Times, Julie and Julia won't be making Mastering the Art of French Cooking a bestseller in France anytime soon. Indeed, most people haven't even heard of a woman who's widely regarded here as, in Meryl Streep's words, "one of the best ambassadors of France ... since Lafayette!" Says one French cookbook author, "Julia Child's cuisine is academic and bourgeois...It shows that in America, the cliché of beef, baguette and canard farci remains." One can only imagine the scorn they'd feel for "Julie"'s cutesy antics. But very few Americans still regard Mastering the Art as their French bible, right? It's a relic as much of the time it came out in America as of France - a definitive treasure trove of classics, but too rich and fussy for modern tastes. But that doesn't mean it wasn't incredibly important - and not just to Ameirca's palette. As much as a cooking primer, Julia Child's book was the beginning of our enduring national girl-crush on France - which that nation has always treated like a cheerleader rebuffing a nerd, scornful and entitled but secretly flattered. In a way, it's sort of embarrassing to think of France seeing the movie, watching that crush play out. It's like they're reading out diary! Can't Julia play it a little cooler, make her infatuation and our clumsy advances just a little less obvious?